Acapulco is a 1989 Westfalen gelding imported from Germany. He has had a long career as a hunter and a jumper, ending his career as a young rider's equitation horse on the indoor circuit. 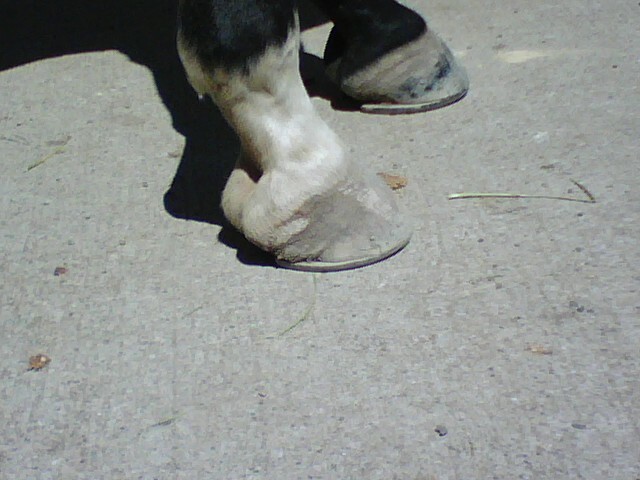 He was competed heavily in the 4' division. 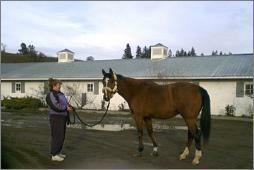 When his rider went to college, Acapulco was sent from his home in Colorado to a well respected sale barn in the east. 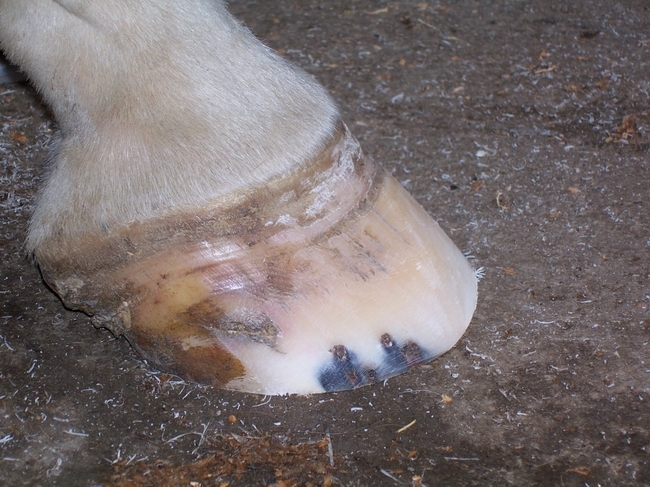 During a vet exam, a nerve block was done that resulted in a staph infection developing in his right front foot. 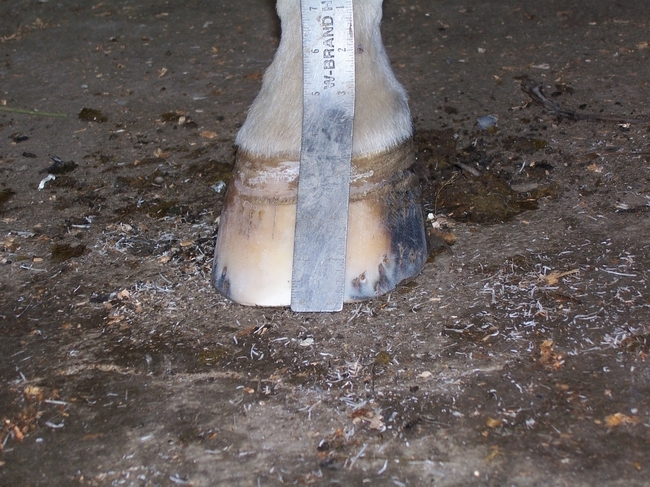 As a result of the infection going untreated, Acapulco developed "iatrogenic laminitis" that resulted in a 15 degree rotation in his right coffin bone. 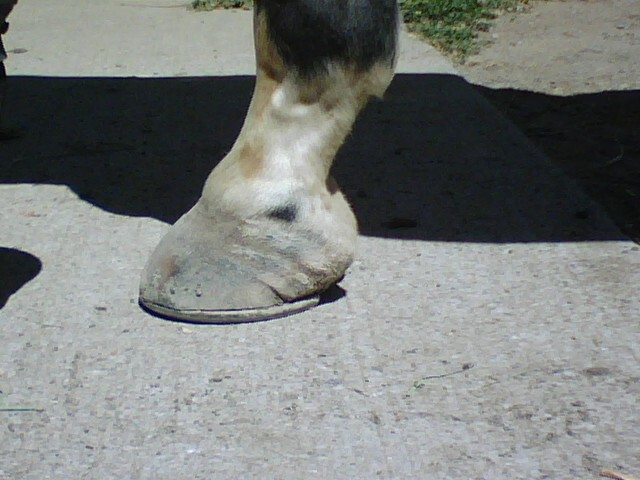 In addition, he had a severely gaping quarter crack on the lateral side of his left front foot. Acapulco was given to Michelle because he was not sound for light riding or jumping as a lesson horse. 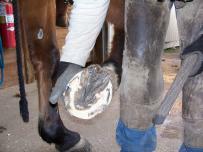 Acapulco's program, like all the rehab horses, has included chiropractic care, acupuncture, and massage. He was also on pharmaceutical drugs when he came off the truck. We immediately discontinued the drugs and starting detoxing him. He has received no bute, no Isox, no drugs of any kind during his rehabilitation. 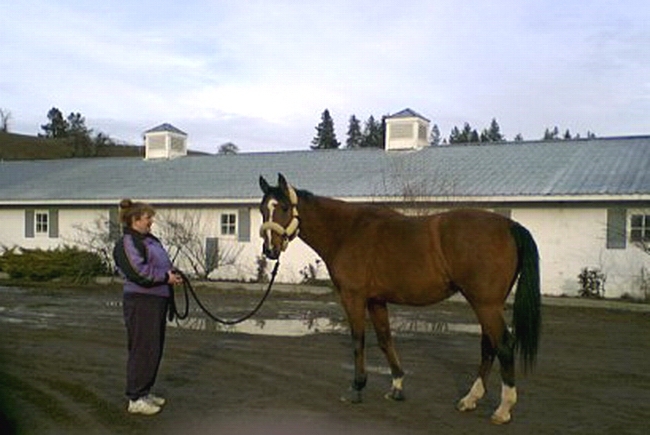 Michelle and Acapulco getting acquainted moments after his arrival at the farm. 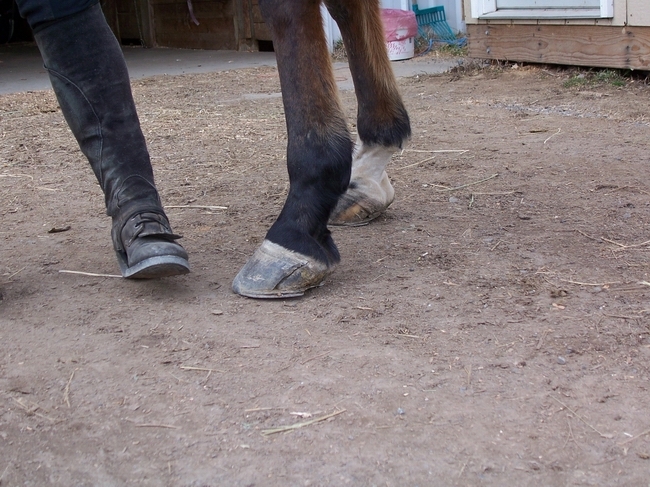 In the first photo you can see his forward shoulder balance over his feet as they were on the day of his arrival. 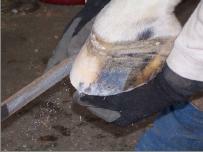 The second photo shows the difference in his balance and posture immediately following his first shoeing with Chris. We focused on getting the toe length under control by beveling the toe from underneath. 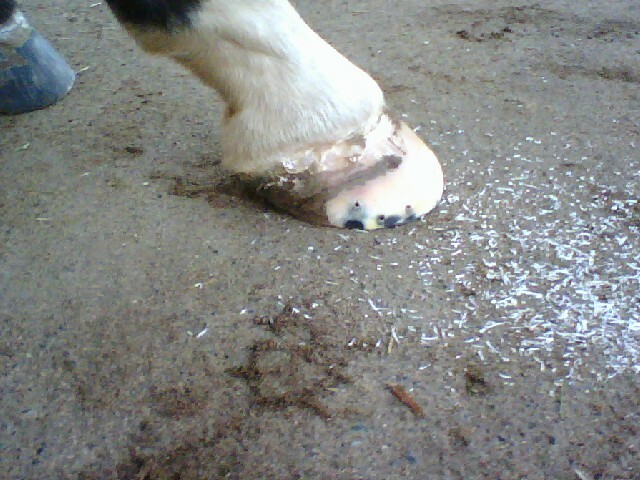 This alters the effective breakover, moving it back so the heel can recover its more upright and normal growth pattern. 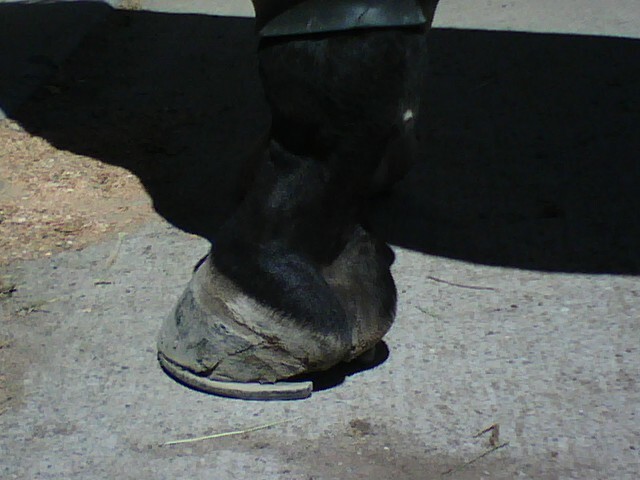 As you can see from the pictures, Acapulco is going to need diligent foot care and corrective shoeing. 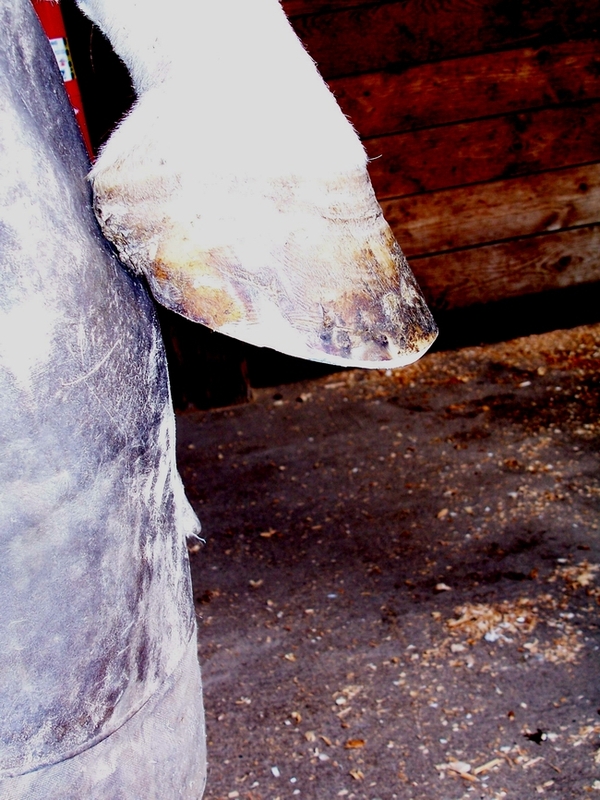 Because of potential complications related to the crack, we can't turn him out at home, so he has to stay on board at the barn where I go every day to work with him. 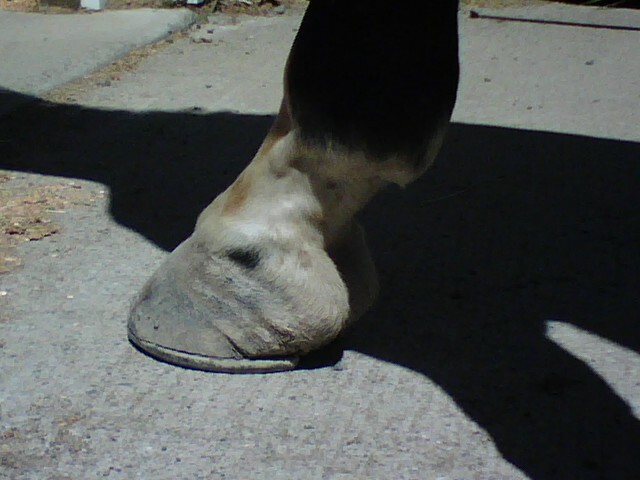 To affect as great a recovery as possible, he will need acupuncture and prescription medications from the vet, nutritional supplements for feet and joints that are expensive, regular chiropractic care, and consistent farriery care. 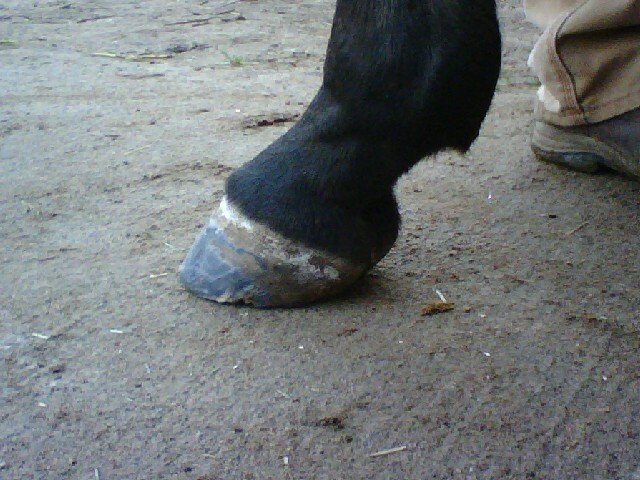 Acapulco's hoof capsules were severely distorted with extremely long toes and under run heels. 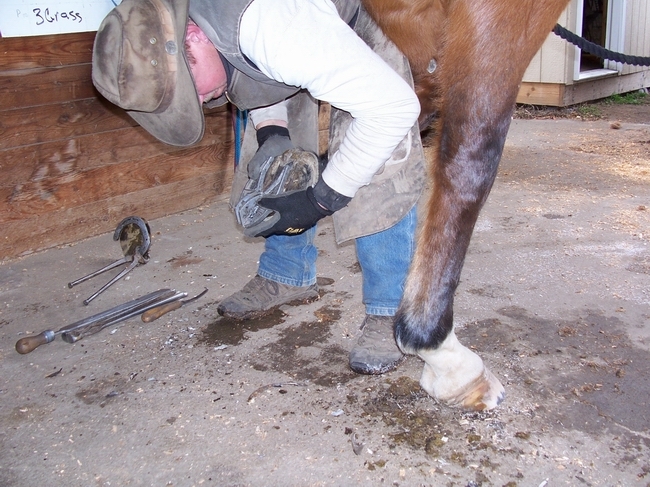 His shoes sat forward on his feet 1.5 inches in front of the bulb of his heels. 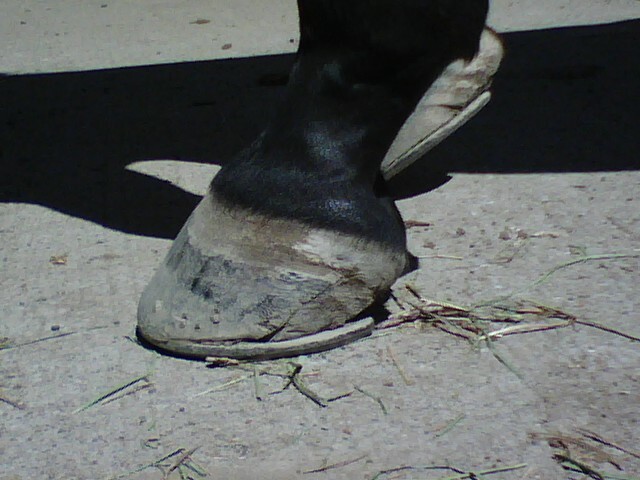 The stress from having his toes so forward had caused the lamina to separate in both front feet. 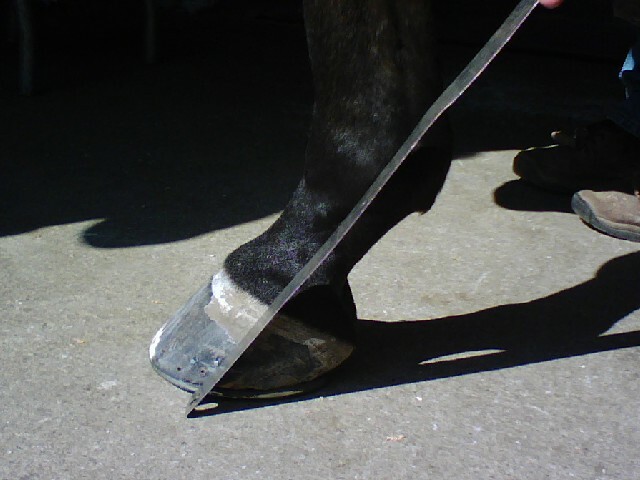 We began by pulling the shoes and giving Acapulco a very aggressive series of trims using a natural farriery technique called "beveling" to bring the toe length back. 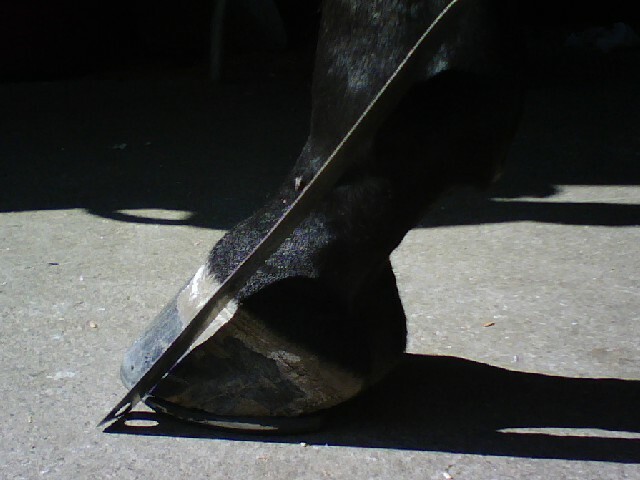 We set each series of shoes back to the edge of the bevel, sometimes 1/2 inch behind his actual toes! 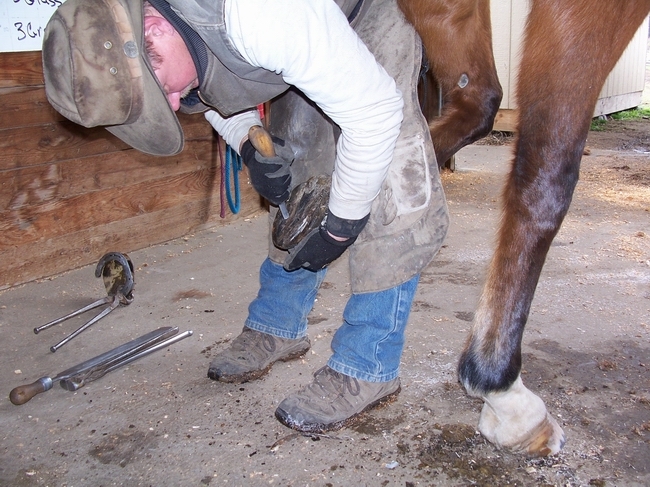 Very conscientious farrier work that brought his hoof angles from 43 degrees to 55 degrees in just 3 shoeings. Acapulco was sound for light work in 6 weeks. 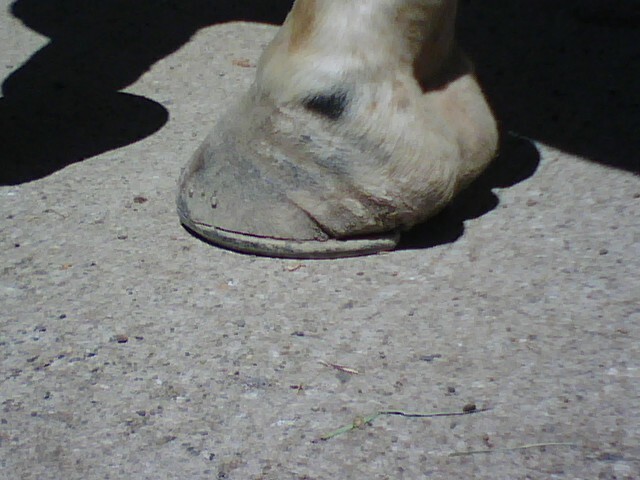 You can see the quarter crack closing up, growing down in each series of pictures. 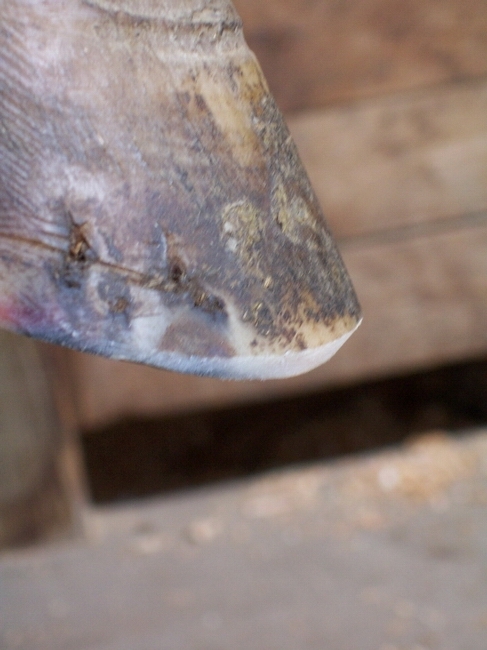 You can also see the transverse stress line that indicates where the heels of the shoes used to rest, growing down and the hoof capsule actually shifting back. In the final set of photos you can see the frog is now a normal shape and length, having shed back to a normal position relative to the coffin bone in the right front, and the quarter crack is completely gone on the left. 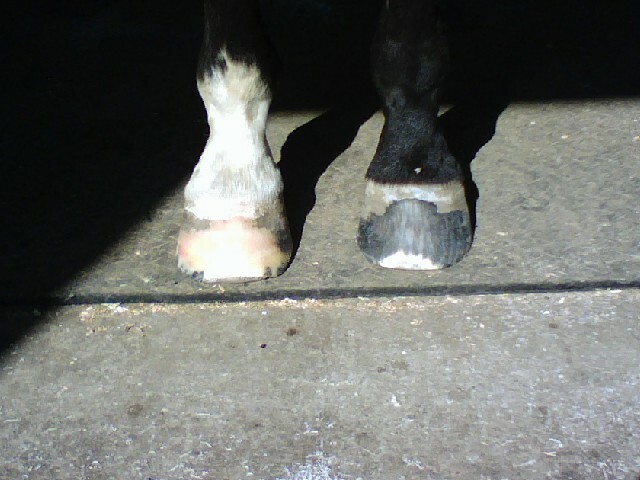 The angle of the right front is 53 degrees, the left is 56, so he wears a three degree wedge on the lower foot as we match the breakover between both sides to even out his strides. One year after we began his program, this magnificent horse is still sound and will be competing at Second Level in Dressage in 2008. Acapulco has completed the 2009 show season with year end high score awards! 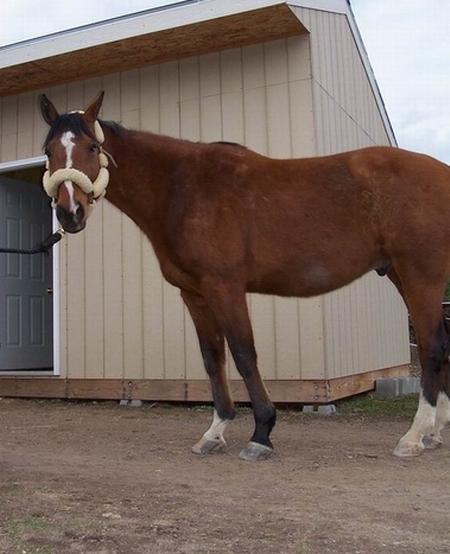 2010 - The big horse wins at Second Level! Acapulco finished the 2010 competition year with an INDA high score award for Second Level Test 1! 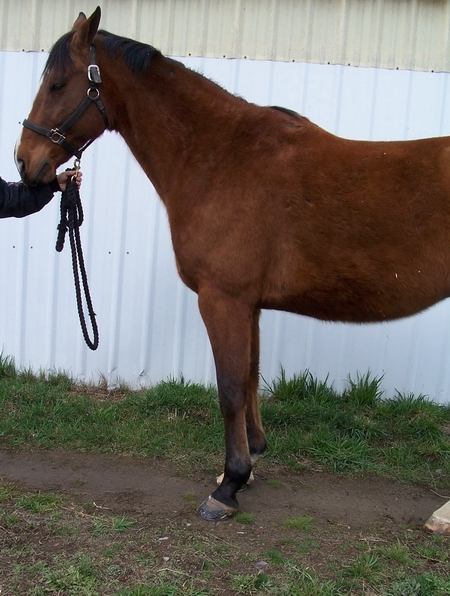 With careful management, Acapulco has been able to participate as a sound horse in shows and clinics in since late 2008 through 2011. At 23 years of age he and I have worked with Dr. Gerd Hueschmann (author of "Tug of War") and Herr Claus Bergener, retired judge of the GNEF, as well as Sue Sherry, a modern classicist. Acapulco is schooling the third and fourth level movements and we look forward to competing in 2011 at Third Level.